The phrase “Get me out” is something you would expect to hear from a kidnapping victim stuck in a car trunk, a person trapped at the bottom of a well, a prisoner chained to a dungeon, or a child locked inside an old-fashioned refrigerator quickly running out of oxygen. All of which makes it an odd name for a cute stuffed animal. Is this for real? It’s not a joke? Ew! It’s awful. And the jingle is awful – needlessly awkward. Too many syllables. Like “as it says” could be removed entirely and would not only not be missed, but be an improvement. Not that this deserves any improvement. Horrible! 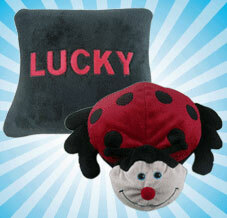 And the ladybug Pillow Pet is much cuter. 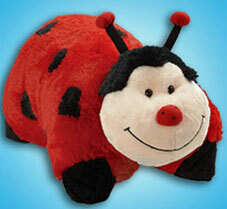 Kind of looks a little like a little piggy disguised as a ladybug. The Get Me Out version looks like some kind of arachnid with a phylum identity disorder trying to pass itself off as an insect! Can I sue them for stealing the technique I used to use on my ex girlfriends? Don’t forget to “sniffy” before unzipping it Josh.